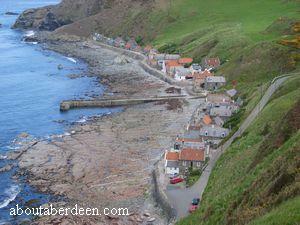 Crovie is a small fishing village near Banff in Aberdeenshire, Scotland. As can be seen in the photograph to the left there are only about a dozen houses, after most of the village was swept away in the storms of 31 January 1953. The remaining cottages were going to be bulldozed into the sea but were saved by local opposition. Villagers of Crovie can only access their homes by foot and belongings have to be pushed by wheelbarrow. A car park further inland is used by residents and their visitors. Crovie evolved after the Highland clearances when Highlanders sought refuge throughout the Buchan coastline. The nearest village a few miles away is Gardenstown. There is no longer a coastal footpath between the two villages because of erosion and sea damage. Crovie had a Mission Hall which served the deeply religious fisher folk for many years until the storms of 1953 damaged the building. It sat derelict for many years until Margaret Leigh purchased the property and converted it into a self catering holiday home. The former Mission Hall was haunted and people had reported hearing the sound of the church organ playing late at night when the building was empty. Margaret had a Bishop from Edinburgh deconsecrate the building in an effort to remove the spirit. Does this friendly ghost still haunt the village of Crovie? On Sunday 16 June 2007 at 9pm television viewers received a rare viewing of a Crovie property when the presenter David Dimbleby went inside a Crovie cottage during the BBC1 programme How We Built Britain. He described how the one roomed cottage would have been a century ago when actively used by a fishing family. There would have been a small cupboard where a bed and mattress would have been tucked away and how the cooking range would always have been lit. The floors would have been layered with stamped down sand to make cleaning any dropped fish or fish guts easier. He also explained why the far off cottages, as can be seen in the top of the photo above, would have had windows facing the sea, but those in the middle of the Crovie village faced each other and had windows on the side and non facing the sea. This is because the strong winds swept into the Crovie village, missing the far off fishing cottages but buffering the middle Crovie properties. They were built this may to afford protection from the winds and the sides of the houses and cottages would house the fishing boats and also protect them from the winds.